Update: See ZENN's update on Canadian availability. 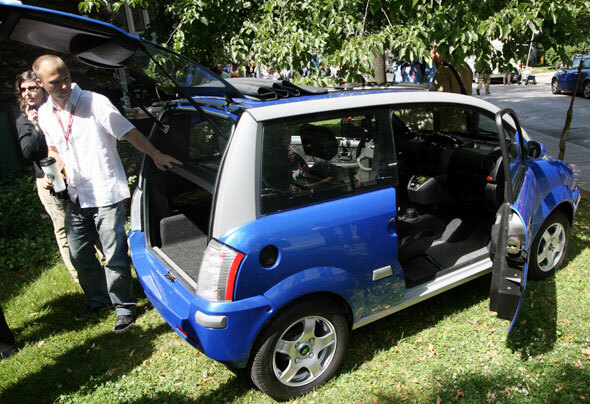 A Toronto-based company, ZENN Motors, has taken the lead in the production of electric cars. Don't believe me? If you too thought the dream of the electric car was dead after watching the excellent (albeit depressing) documentary Who Killer the Electric Car it's time to think different. I took the above photo of the ZENN earlier today outside the Isabel Bader Theatre while attending the ideaCity 2007 conference. This is the real deal friends. The car is slick and I want one. It seemed that everyone else who saw the car today wants one too. The problem, however, is that we can't buy one. Although the car is now available for sale in 48 US States, no Canadian government has approved it for sale in Canada. In fact, Queens Park refused to even entertain the idea until Al Gore cornered Dalton McGuinty earlier this year and insisted that he make it happen. The sad fact is although the Premier recently unveiled a number of initiatives to reduce greenhouse gases, he failed to take the lead on the electric car issue, wiltering under pressure (as every other provincial government has done) to the powerful petroleum lobby. When you consider that motor vehicles contribute somewhere in the neighbourhood of 2/3 of our greenhouse gases, this is simply unacceptable. There is huge pent-up demand for these types of vehicles. Enviro-conscious consumers (growing by the numbers every day) are desperate for a cost-effective, realistic solution to help them curb vehicle emissions and the ZENN electric car, at a retail price of approximately $14,000 has the potential to be it. Unlike hybrid-vehicles, the ZENN electric car eliminates the need for petroleum completely and outside of high-end, impossible to get models like the Tesla Roadster is the best solution on the market. And from a Toronto-company to-boot! And if that's still not good enough consider the noise reduction that could result if electric cars were widely adopted. These vehicles are essentially silent. The ZENN, a Zero-Emission, No Noise, and 100% electric vehicle travels at a regulated maximum speed of 40 km/hr and provides a range of roughly 60 kilometers on a single charge. In addition to remarkably low operating costs (energy equivalency of .96L/100Km or 245 MPG), using a ZENN in place of a conventional car can eliminate over 6 tons of CO2 from the atmosphere each year. Despite that, there may still be a silver lining. During a morning session today at IdeaCity ZENN Motor Company Founder and CEO Ian Clifford hinted that Al Gore confronting Dalton McGuinty resulted in huge progress and they expect the ZENN could be approved for sale in Ontario before the end of the year. 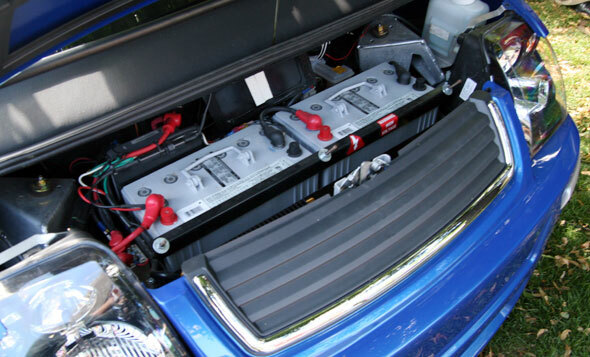 Looking forward to 2008, the company is hard at work on a new model that will come equipped with an even better battery and other significant improvements. That's not to say that the existing battery or model is deficient by any means. There are over 100 of these cars on the road in the US and it continues to rack up awards. The photo above shows just how easy the charging process is. 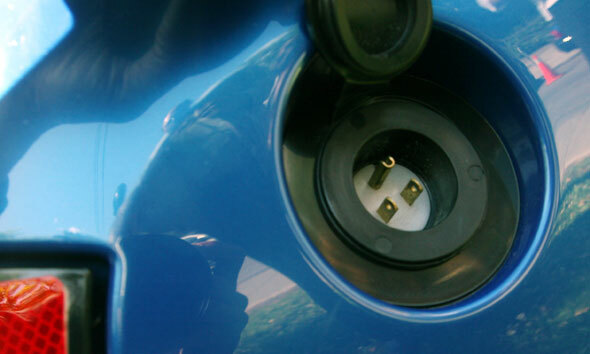 The car takes a regular plug that simply plugs in to a regular wall socket. Every charge will add only about 35 cents to the average electricity bill so given the high price at the gas pumps these days, the ZENN not only presents obvious environmental benefits but economic ones as well. For more reading, check ZENN's web site which has lots of links to previous media coverage about their electric car.